If you have this problem, you may be worried that you got ripped off. Don't worry: You can fix the problem by following these steps. This situation is caused by a feature of Apple's Find My iPhone service called Activation Lock. 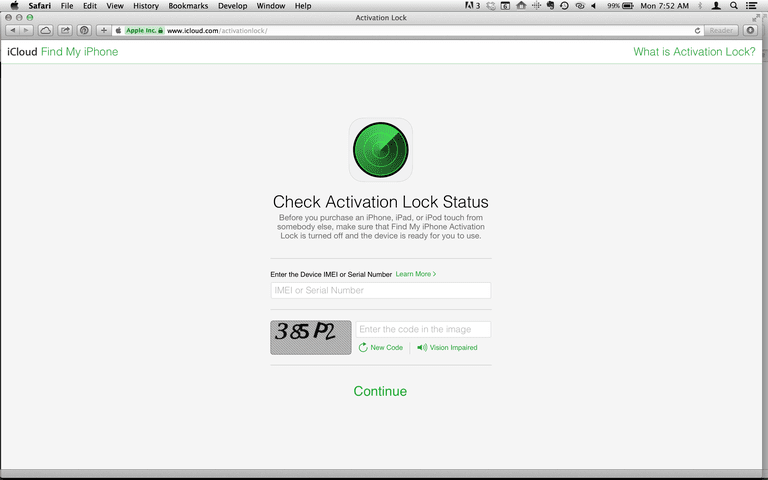 Activation Lock is a security measure that Apple added to deal with the rash of iPhone thefts. Previously, if someone managed to steal an iPhone and not get caught, they could simply erase it, resell it, and get away with the crime. Activation Lock changed that. When the phone's original owner has set up Find My iPhone on the device, the Apple ID that was used is stored on Apple's activation servers along with info about that phone. Those activation servers will only activate the phone again if that original Apple ID is used. Not having the Apple ID is why you're being blocked from activating or even using the phone. That helps prevent theft: why bother stealing a phone that won't work? On the other hand, it doesn't help you if you purchased the phone legitimately. Dealing with Activation Lock is frustrating, but it's also relatively easy to solve. Most likely, the previous owner just forgot to turn off Find My iPhone or erase the device properly before selling it (though it could also be a sign that you've got a stolen device, so be cautious). You just need to contact the previous owner and have him take a couple of steps. In order to use your new iPhone, you'll need to remove Activation Lock by entering the previous owner's Apple ID. Begin the process by contacting the seller and explaining the situation. If the seller lives near enough to you that you can bring the phone back to him, do so. Once the seller has the iPhone in hand, he just needs to enter their Apple ID on the Activation Lock screen. With that done, restart the phone and you can continue with the standard activation process. Things get a little more complex if the seller can't physically access the phone. In that case, the seller can use iCloud to remove the phone from his account by following these steps:. Go to iCloud.com on any device. If you access iCloud.com on your iOS device and have Find My iPhone installed, you will see an option to Open Find My iPhone. Tap that to proceed. Sign in with the Apple ID they used to activate the phone. Click the phone they're selling you, then click the "i" icon to see the details. Click Remove from Account. You may need to have the previous owner Erase the device first, if they haven't done so already (see below). With that done, you should turn the iPhone off and then back on. If you can proceed with the normal activation process, you're good to go. If you turn on your new phone and see either the iPhone's homescreen or the passcode lock screen, the seller didn't properly erase the phone before selling it to you. In this scenario, you need the seller to erase the device before you can activate it. If the phone runs iOS 10 and up, the seller should sign out of iCloud and then erase the device by going to Settings > General > Reset > Erase All Content and Settings. If the phone runs iOS 9, the seller should go to Settings > General > Reset > Erase All Content and Settings and enter their Apple ID when prompted. When the erase process is complete, the phone will be ready for you to activate. Sign in with the Apple ID they used on the phone they're selling you. Select the phone they're selling you. When the phone is erased, click Remove from Account. Restart the phone and you should be able to set it up. Sign into it with the Apple ID they used on the phone they sold you. Select the phone they sold you. Tap Erase iPhone (it's the same button name, but on a new screen). Restart the iPhone and begin setup. If you're going to sell your iPhone, you don't want to be bothered by your seller telling you that you didn't turn off Activation Lock or didn't deliver the phone to them in a usable state. Make sure you have a smooth transaction by doing all the right things before selling your iPhone.